DESOTO—Known as the Donut Boy, eleven-year-old Tyler Carach, is on a mission. For the last two years he has spread good cheer and donuts to police departments around the country. 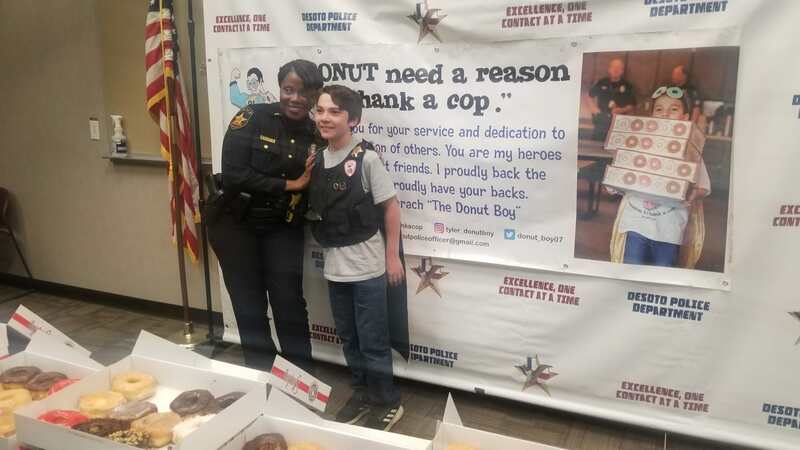 Carach, from the panhandle of Florida visited the DeSoto Police Department this past Friday to say, “Thank You.” He was met with not only the officers in DeSoto, but neighboring cities as well. In the end, Carach wants to thank every cop in America with a donut for their service. At last count he had traveled to 44 states and given away 80,000 donuts. That is just an estimate though. Carach has been traveling the last few weeks while on spring break and he has been to Texas twice over the years. Sometimes he and his mother travel on school days too. As Carach attends a charter school and they have the capability to send him work while he is on the road. Based on their hand gestures, Donut Boy shares a learning moment with Deputy City Manager Tracie Hlavinka and one of the DPD’s external affairs representatives while Chief Joe Costa looks on. 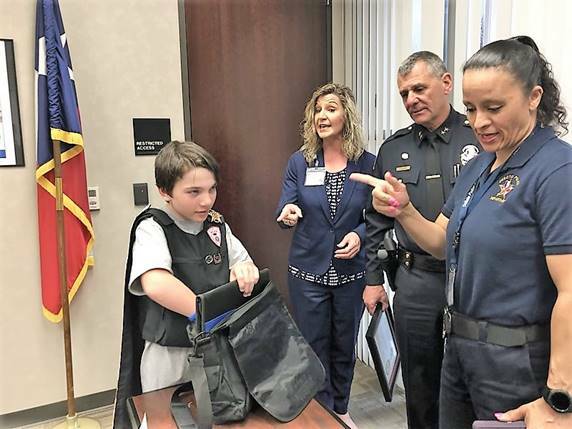 Months ago, the fifth grader was enticed to visit DeSoto when he met Police Chief Joseph Costa in Destin, Florida. When Costa met Carach, he invited him to DeSoto. Carach was happy to add the city to his Texas tour. After DeSoto his next Texas stops were Amarillo, San Antonio and Austin. To make his donut dreams reality, Carach receives support from different beneficiaries as he travels around the United States. “We gave him some goodies and a lot of police officers came from different agencies to say hi and thank him for what he does. It is a good deal,” Costa concludes.